It was while stranded in Venice with their annual floods that Susi found herself trapped in the Academia. During this time she studied the Iconic paintings of the early Italian artists. 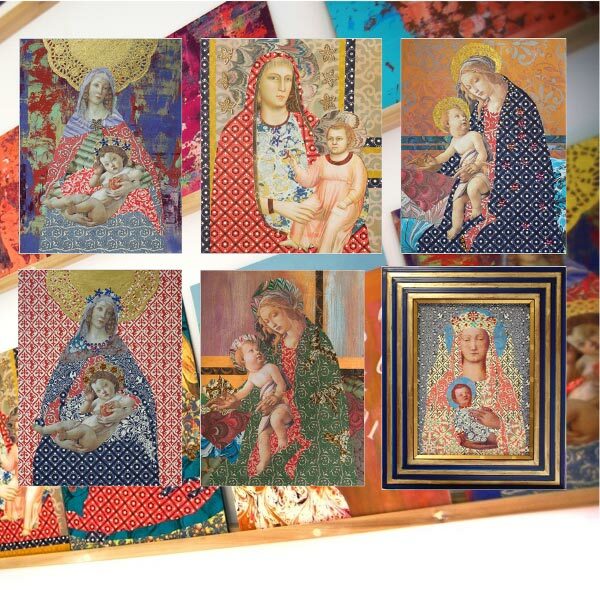 Inspired by the iconography of the familiar street-corner shrines and her sketches from Venice, Susi has used collage to create her own dynamic Madonna, enveloped in the decorative and emblematic surroundings of familiar Florentine design. This series of work is made using wrapping paper in traditional Florentine patterns, beads and gold bakery foil. As in all of Susi’s artwork the busy texture of the surface is set against the simplified, compositional forms. The frame, which is made by an artisan in Florence, and background of each work is integral in the effect of the imagery she is trying to create. The design element of juxtaposing the religious content of each piece with the more everyday decorative quality takes away some of the preciousness of religious art, resulting in a collection which is simultaneously accessible, somewhat kitschy and profoundly moving. Susi is a mixed media artist whose work ranges from painting to collage to printmaking. Her background as a fashion editor for Conde Nast Publications filters into all her practice and she often works in stories or collections as she did when creating visuals for the magazine world. Recently graduating with a MA in Fine Art at Northumbria University in Newcastle, England, Susi now works from a studio in Newcastle and lives in Northumberland near Hadrian’s Wall. However previous to this she spent almost seven years living and working in Florence where the inspiration of both Renaissance art, fashion and architecture has informed her work ever since. Her collage work was inspired by the Renaissance religious art, the gilt edged frames still produced after generations by artisans in the back streets of Florence and the flaking plasterwork of the Palazzos with their colourful Pietra Dura marble floors and sumptuous interiors. 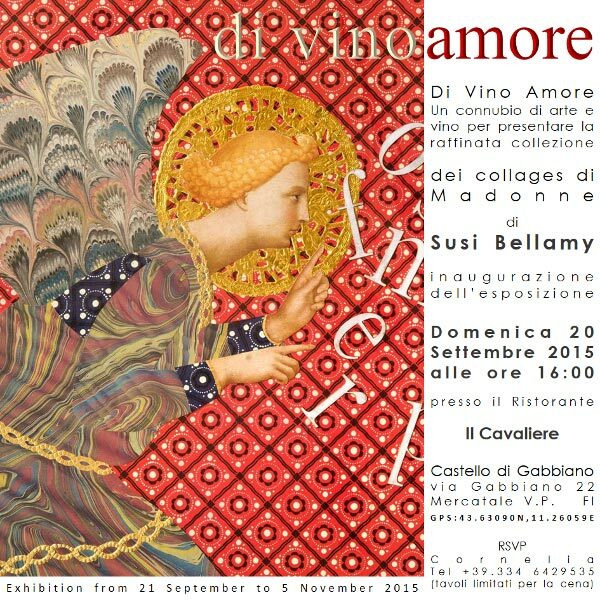 Returning to Florence to show this collection brings the Madonna collages back to their spiritual home.